Posted on December 15, 2015 at 11:00 pm. Are you a master of pub trivia? Love a good game show like Eggheads or The Chase? Or maybe you just have excellent intuition and good Google skills – wherever you sit on the quiz master scale is irrelevant as everyone has a good chance of winning on Guts Christmas Trivia. Each day Guts is releasing a new trivia question with multiple choice answers, and all you need to do is sign in or open a new account, join the trivia promo and log back in every day of December until Christmas Eve to answer the new question and you’ll be in the running to win some massive prizes. Sign into your Guts account, or if you’re new to this great venue, click our links to register and you’ll also receive a $400 welcome package and 100 free Starburst spins upon your first real money deposit. 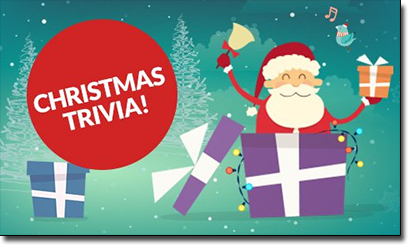 Head to the Christmas Trivia section and answer todays multiple choice question, with a new question available every 24 hours. You have 72 hours to answer each question before it’s no longer available and only have one shot at the correct answer. For every correct answer you submit, you’ll gain points to earn your way to the Christmas Trivia Leaderboard, so the more days you play the better your chances are of securing a higher position. You can check your place on the leaderboard at any time to see how you’re progressing. Fear not if you submit an incorrect answer, as you’ll also be given 24 hours to complete a Christmas mission which can earn you extra points. The top 75 players on the Christmas Trivia Leaderboard at the end of the promotional period win a prize, so if you opt-in every day, submit a correct answer and complete the daily missions there’s a big chance you won’t go home empty handed. The prizes vary depending on your position on the leaderboard, but consist of casino bonuses, free spins, cash prizes and Guts merchandise. All winners at the end of the promo will also go in the draw to win Apple gadgets including two Apple Smartwatches and an iPad Mini 4. Note that all prizes are subject to small wagering requirements – check the terms and conditions of this promo at Guts.com for further details. Ready to put your trivia skills to the test in hopes to make this holiday season one you’ll never forget? Head to Guts.com before Christmas Eve and make the most of those daily missions to boost your chances of winning.